Sacred Hawaiian Custom or a Disrespectful Mistake? Frogs and toads are certainly a common find along Connecticut trails and every hiker has surely come across plenty of these amphibians. What hikers may not realize is that the vast majority of the frogs and toads that they find represent only the few dominant species found in the state. These include many familiar creatures such as the the American Toad and the Common Bullfrog, but perhaps the most common of them all is the Green Frog. Green Frogs (Rana clamitans) are truly ubiquitous throughout Connecticut. They can be easily discovered within or nearby just about every lake and pond in the state as well as around brooks and streams. You’ll even find these frogs in swamps or some of the longer-lasting vernal pools. Wherever some measure of freshwater can be found, the Green Frog is likely to make an appearance. But why are these frogs so common? How did they come to be some of the most successful frogs in the entire state? At least one reason for their success is that they inhabit terrestrial/aquatic “ecotones”, meaning that they tend to reside in places where drier land transitions into an aquatic habitat such as the banks of a stream or the side of pond. So, while they are comfortable venturing onto land, they are usually only few jumps from water. This may seem like a rather inconsequential trait, but we get a better idea of why this is so beneficial if we compare Green Frogs to another amphibian such as the American Toad. The American Toad is almost strictly a terrestrial creature, so you will rarely find them hanging around ponds or streams except by coincidence. This can sometimes pose a problem for the American Toad because it has little chance of escape once it is discovered by one of its terrestrial predators. Green Frogs, on the other hand, are able to routinely elude terrestrial predators by simply leaping into nearby water and staging a quick getaway. Hikers that have walked beside brooks or ponds along a trail will be very familiar with this habit, for most Green Frogs are only noticed once approaching humans hear them “plop” into the water only a few feet away. You may even hear escaping Green Frogs make a distinctive chirp before they splash to safety, a tactic which warns all nearby Green Frogs of a potential threat. But while evading predators may be crucial to the success of the Green Frog, its own predatory habits may also contribute the ease with which it manages to survive. The Green Frog is a carnivore and it will literally eat almost any animal it can swallow. This can include many hundreds of species of insects (if not thousands), but these amphibians also dine on more unexpected types of prey such as fish, snakes, crayfish, snails… even other frogs and tadpoles! Thus, almost any habitat available to the Green Frog is bound to provide a bountiful and nearly inexhaustible buffet; starvation is rarely an issue for these opportunistic eaters. There is no single, “silver bullet” adaptation that has enabled Green Frogs to achieve such strong numbers and secure populations. In fact, in many ways, they aren’t too much different than most other frogs or toads found throughout the state. What really gives Green Frogs an incredible advantage in the lands of Connecticut is simply their enormous degree of flexibility: they can live almost anywhere that water is found, they eat almost anything small enough to fit in their mouths and they possess a natural talent for making split-second escapes. This simple formula means that, in the everlasting struggle we call “survival of the fittest”, they tend to be fit enough to prevail in almost every circumstance. The same cannot be said for many other species of amphibians throughout the state. Habitat destruction is probably the prime contributing factor for the steady decline in many amphibian populations across Connecticut. Species such as the Wood Frog, for example, absolutely must have access to vernal pools in order to reproduce successfully. As further land throughout the state is developed and these vernal pools are destroyed or disturbed, the Wood Frog finds itself being displaced further and further from places that may have previously provided perfect habitat for thousands of years. Unlike the adaptable Green Frog, many amphibian species throughout Connecticut stand to be severely-impacted, perhaps even eliminated entirely, as we change the face of the landscape to be more suitable for humans. 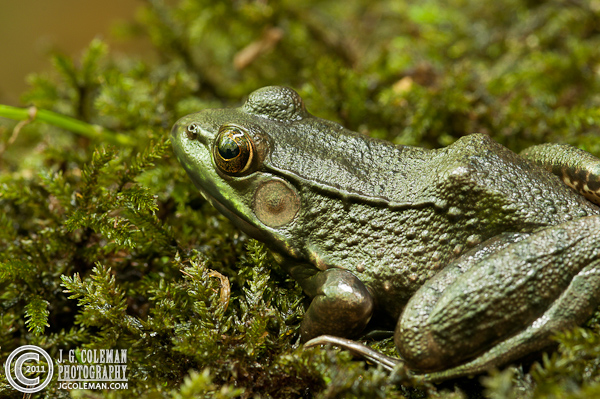 Photograph of Green Frog © 2011 J.G. Coleman Photography. View more photography by Trails of Freedom Chief Researcher, Justin Coleman, at J. G. Coleman Photography. Disclaimer: The hiking videos, articles and trail descriptions found on this site are for informational purposes only. Trails of Freedom LLC is not responsible for any accidents, injuries, rescues, inconvenience, or loss of life by anyone attempting any of the hikes on this website. It is up to each individual to know their limits, and use common sense and good judgement when participating in any outdoor activity. © 2015 Trails of Freedom LLC.